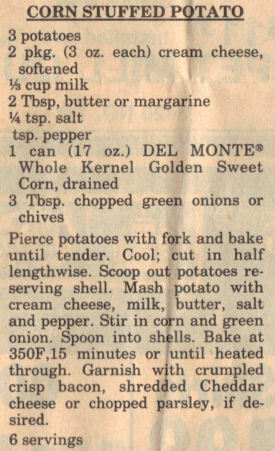 Pierce potatoes with fork and bake until tender. Cool; cut in half lengthwise. Scoop out potatoes reserving shell. Mash potato with cream cheese, milk, butter, salt and pepper. Stir in corn and green onion. Spoon into shells. Bake at 350F, 15 minutes or until heated through. Garnish with crumpled crisp bacon, shredded Cheddar cheese or chopped parsley, if desired.